I liked the first one a lot. Had a wonderful etherial quality to it. Sorry, not the collage so much. 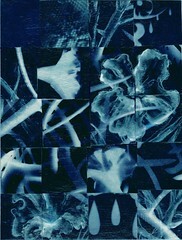 You'll have to explain that whole cyanotype to me some time. I like the first one but see where you thought it needed improvement. The X was a little over powering.